A/B testing is becoming more and more common as teams realize how important it is for a website’s success. The Web is a huge, competitive marketplace with very few (if any) untapped markets, meaning that being successful by offering something unique is rare. Much more common is that you’re competing for the business of your customers with several other websites, so attempting to convert every visitor into a customer or upselling/cross-selling your services better could make all the difference to your bottom line. Due to this, the market for A/B testing tools and CRO (conversion rate optimization) tools is growing exponentially. But choosing one can be quite a time-consuming challenge, so in this article I’ll compare the best A/B testing tools to help you decide which is most suitable for you or your team. If you want to get up to speed with A/B testing and CRO, check out our recent Introduction to A/B Testing article. TL;DR: A/B testing is about experimenting with visual and content changes to see which results in more conversions. A/B testing often follows usability testing as a means of testing a solution to a flaw in the user experience identified using metrics like bounce rate in an analytics tool like Google Analytics, and thanks to the depth and quality of A/B testing tools available now, A/B testing is accessible to designers as well as marketers and developers. Consider this scenario: You have an ecommerce store built with Magento. You’re aware that in certain cases it may benefit stores to add a one-step checkout solution instead of the standard multi-page checkout, but you’re not sure if your store fits that use case. You need to test both options and compare the results with/without the one-step checkout experience. You know that running two versions of the checkout simultaneously requires changes to the code, which is a complex matter. With Optimizely, you can send a certain amount of your users to a totally separate checkout experience to collect conversion data. If the experiment yields negative results, you delete the experiment and the original checkout web page still exists and works fine. No harm done. With their Web Experimentation tool, which offers an easy-to-use visual editor to create A/B tests without requiring a developer (optional), the ability to target specific user types and segments, and create experiments on any device, Optimizely has all your bases covered. Although you can run A/B tests without a developer, your variations can be more targeted (for example, your variations can go beyond color, layout and content changes) if you have the skills and/or resources to develop custom experiments with code. By integrating your A/B tests into your code, you can serve different logic and test major changes before pushing them live. Also, if your product extends beyond the web, Optimizely works with iOS, tvOS and Android apps. Optimizely’s Full Stack integrations makes it possible to integrate A/B tests into virtually any codebase, including Python, Java, ruby, Node, PHP, C#, Swift and Android. 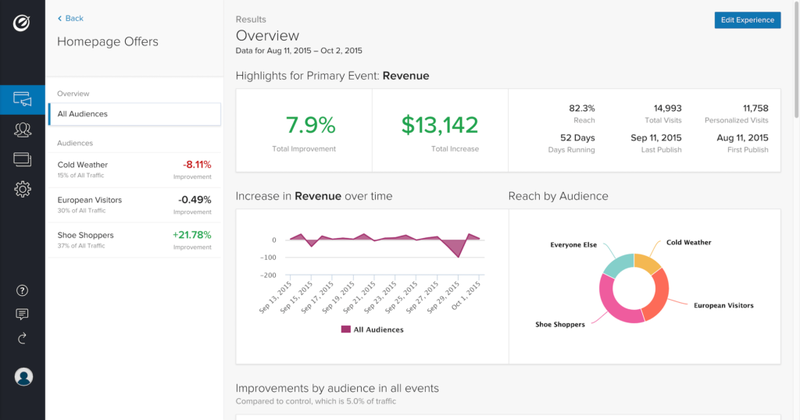 Google Optimize is a free, easy-to-use tool that integrates directly with your Google Analytics Events and Goals to make A/B testing quick and easy! It’s ideal for traditional A/B testing, focusing on comparing different CTA (call to action) elements, colors and content. It’s not as sophisticated as Optimizely, since it doesn’t allow you to create custom experiments with code/developers, but it’s free. It’s great for those starting out with A/B testing. 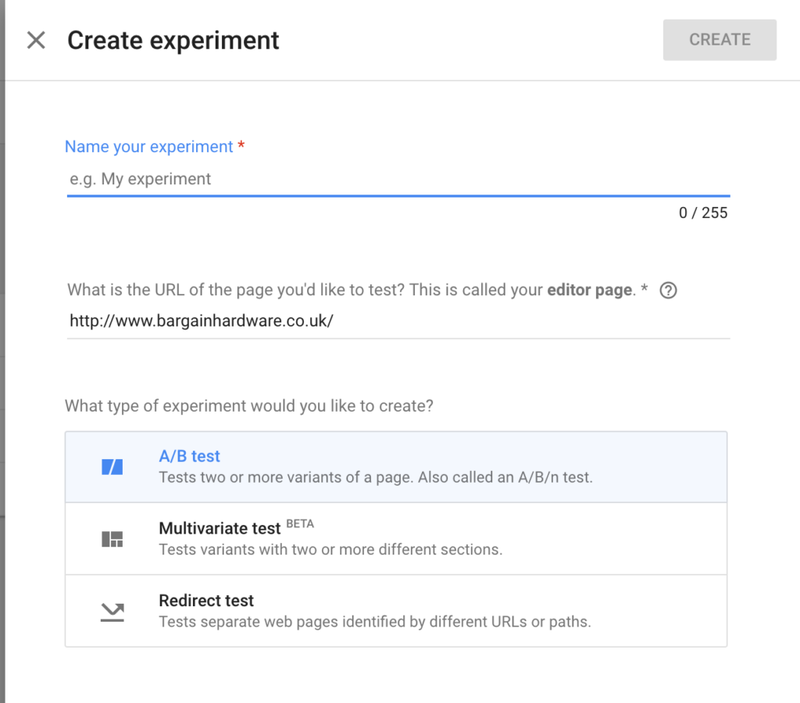 For each Google Optimize experiment, you’ll need to specify which Google Analytics Goals or Events will be the baseline for your A/B tests. For example, if you were A/B testing a product page, you could use an “Add To Basket” event that you’ve defined in Google Analytics to evaluate which of your variations converts the best. The Google Analytics report then gives you a clear indication of which variation converts best. It’s ideal for those on a low budget! Just don’t get carried away, as Google famously once did, by testing 40 different shades of blue to see which converted best!